MK2b Heated Bed 300x200mm The hot bed is responsible for heating the bottom of the 3D printer, so .. Rigid coupler Shaft from 8mm to 8mm, commonly used for Z axis. Material: Aluminium Input: .. 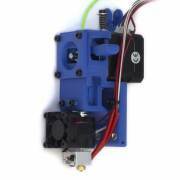 Complete extruders, assembled hotends, replacement, nozzles, different pulleys, etc. Great variety where you can find what you need. Based on: https://www.thingiverse.com/thing:2228901 Extruder kit content (configurable):Hotend Chimera style. 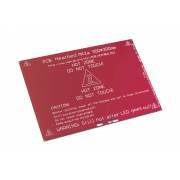 Equipped with fan 3010,2x 40w heating cartridges, 2x NTC 100kΩ thermistors, Teflon tube and 4 BSP connectors PC04-1 2x Motors Nema 17 - length 40mm - wi.. Composition: -Printed parts (ABS) -MK8 Drive Gear -Bearings: 1 x 608zz 1 x MR105ZZ -Hardware: 4 x M3 Washers 4 x M3 Nuts 1 x M3 25mm 2 x M3 30mm 1 x M3 6mm .. Advantages: It can print any material: From PLA, due to it thermical barrier made of stainless steel and its dissipation with forced ventilation, to Nylon, Polycarbonate, Polyoxymethylene y others thermoplastics which need higher temperatures. And also, as it is natural, it can pr.. Advantages: It can print any material: From PLA, due to it thermical barrier made of stainless steel and its dissipation with forced ventilation, to Nylon, Polycarbonate, Polyoxymethylene y others thermoplastics which need higher temperatures. And also, as it is nat.. The main advantage of this Hotend with respect to the conventional V6 is the change of the heating block and thermistor.It is an encapsulated thermistor, which makes it more resistant to deterioration and breakage.Also, as an insulator, use a silicone sock specially adapted for the heating block.. This teflon tube stands out from others due to lower friction and tighter and more precise tolerances.Features: It is made of polytetrafluoroethylene resin by pressing.Excellent resistance to high and low temperatures: it is not affected by the temperature change, having a wide temperature ..